Last week the pair had reached the local highs at the level of 1.6920 but after the failure to consolidate at this level, the pair started the decline, which halted at support level of 1.6830. Yesterday was a Bank Holiday in the USA; therefore the trading was sluggish and slow in the range of 25 points. Today, after the opening of the Asian session, the price of GBP/USD has grown and now the pair is trading at the level of 1.6870. Economic calendar is uneventful today. The data, which is of interest for investors, will be released on Thursday. It will be preliminary GDP of the USA for Q1. Technical indicators demonstrate mixed signals. Stochastic is in the overbought zone, its lines have not crossed yet. In case of intersection of these lines we will get a sell signal. MACD histogram is near the zero line, indicating sideways movement. Support levels: 1.6860, 1.6840 and 16830. The latter one coincides with Fibonacci retracement of 61.8% and is the key level for the “bears”. Resistance levels: 1.6870, 1.6880, 1.6900 and 1.6920. 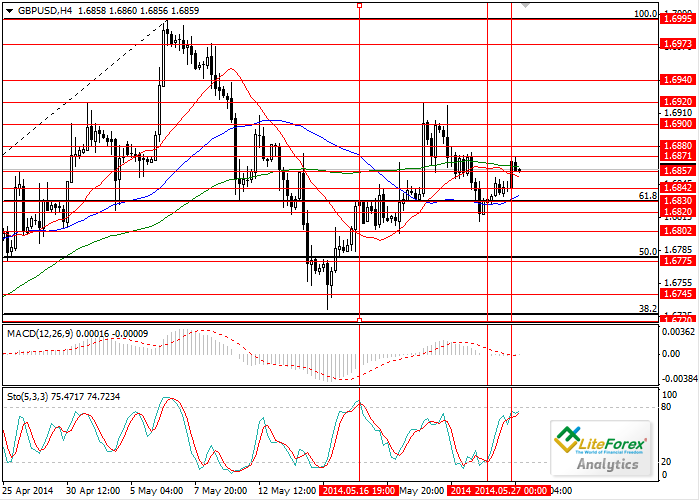 It is recommended to open long positions after breakdown of the level of 1.6870 with the target of 1.6920. In case of decline, it makes sense to place limited buy orders at the level of 1.6830. Short positions can be opened below the level of 1.6820.